Philly pol helps Wawa open its first store in D.C.
Philadelphia Congressman Brendan Boyle, center right, helps open Wawa's first store in Washington, D.C. on Thursday morning. 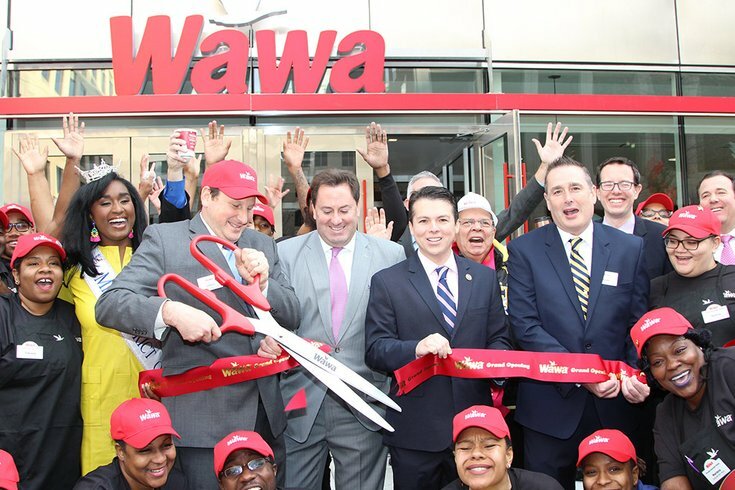 Wawa opened its first Capital City store on Thursday morning and a Philadelphia politician helped lend the ceremonial ribbon cutting a bit of authentic, local flair. Congressman Brendan Boyle, D-13, who represents parts of Northeast Philadelphia and Montgomery County, was on hand to help the chain founded here to open its first Washington, D.C. location – a huge store at 1111 19th St. NW, just south of Dupont Circle. Wawa, of course, has its roots in the Philadelphia area. According to the Washington Business Journal, the 9,000-square-foot store’s “upscale” decor will cater to the business district. Patrons of a bunch of nearby college bars are sure to make use of the 24-hour location. It will also feature outdoor seating, a popular offering at the chain's stores in Florida. Who knows, the convenience store is just 3,000 feet from the White House, so maybe President Trump will stop in for a Shorti. A second Wawa location is planned to open in Georgetown by the end of 2018.